A group of Taiwan scientists have developed an environmentally friendly form of rewritable electronic paper that works without electricity, similar to e-books like the ones shown but that does not need to be back-lit. A group of Taiwan scientists have developed an environmentally friendly form of rewritable electronic paper that works without electricity. 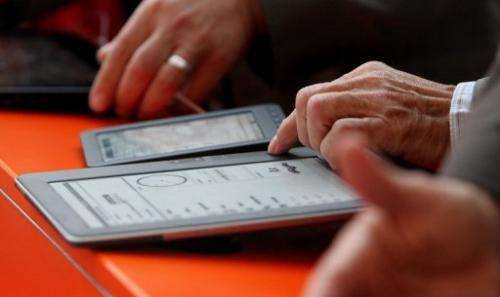 Unlike the e-book technology now available on the market, the rewritable e-paper called "i2R e-paper" does not need to be back lit and therefore does not consume electricity, according to the island's top industrial research unit Industrial Technology Research Institute. "It only requires heat to store or transmit images onto the flexible display," said Frank Hsiu, a senior official at the Institute's Display Technology Centre based in the northern Hsinchu city. He said writing on the paper can be erased by inserting it into a thermal writing device similar to what is used in fax machines. The technology can be used in products such as digital books, electronic bulletin boards and large-sized digital bulletin boards, the institute said. "At the moment, research results at the laboratory showed that you can write on such paper for up to 260 times," Hsiu said. "You can imagine how much paper and how many trees can be saved if this product is widely used in the world." The institute has transferred the technology to a Taiwan company, and expects the product to hit the market in a year or two. How is this better than basic digital projectors like we all used in college and normal business presentations? 1) Current e-Book technology doesn't need to be backlit, nor does it use power unless the image is changed. This 'paper' needs electricity to change the image too, possibly more, for the thermal printer. But this is not a new eBook display anyhow! 2) I just watched a Reuters video about this, and noted that the 'paper' seems to lacks image contrast and was not printable at the edges. I guess they intend to target specific applications only. 3) How 'eco' is it? - Not every sheet is going to be used 200 times in the real world - chances are much will be thrown away early regardless of the fact it could be used again. How many times must it be used before it has a net positive effect over normal recycled paper? Does it decompose if discarded? Can it be recycled when 200 uses are done? What about all the new thermal printers to be manufactured and then sitting around in offices, in standby mode, alongside their traditional paper counterparts?! I think the best application for this would be a reusable notebook. Sheets of paper would get lost, thrown away, etc. But a reusable notebook, that would be valued more. A student could use the same notebook for multiple years. What would really work is to allow the contents to be uploaded by the notebook. In the end, though, everyone will be using tablet PC's and this will be an afterthought. Nice to see technology advancing! A small portable chalkboard is cheap and reusable as long as you buy more chalk. It can be erased without a thermal machine. There are also pen-writable surfaces that can easily be wiped clean. This e-paper would only be interesting if it could be used for data entry. That doesn't seem to be the case. I am pleasently underwhelmed by this tech. Doesn't need electricity , only heat ?.....ok..and the source of this heat is...? Well normally I'd say yes, but it's currently unplugged and in a box under the couch. Something between the two already exists for sale; Google for 'Boogie Board Writing Tablet'. Even by Physorg's loosest standards this article is utter crap. Almost completely lacking in any statements that even remotely fit reality. I know Phyorg didn't write but surely someone read it before posting it. HOW THE HELL DID IT GET POSTED? That is one of the few things that might be accurate. Someone said. Oh I suppose the device can be erased by heat. But EVERY claim about the use of electricity was false. How the hell were there FOUR votes that this was a good article? The first sentence is a lie and then it goes downhill. similar to e-books like the ones shown but that does not need to be back-lit. Was the ebook backlit. NO. Do they need backlit. Not the version shown.